Holster material needs to be thought about even though it isn’t strictly a male/female issue. Suede and nylon while light and non bulky can fold on top of itself making putting the pistol back in difficult. Leather is stiffer, but is tough to wash and can be smelly. The plastic holsters are much more durable, but are bulky and can clunk against things. 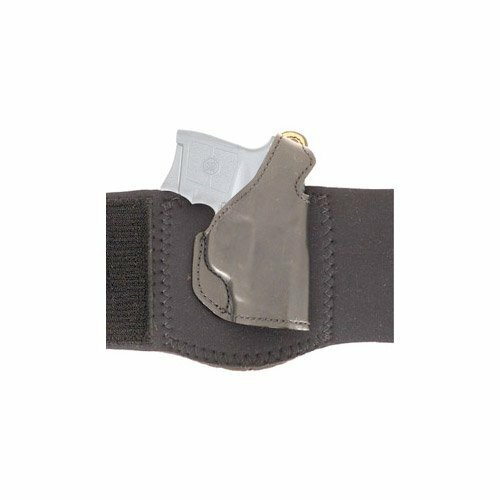 These are all things to think about as you look at holsters and carry locations. You really need to think about your lifestyle and decide on a carry location that is going to best suit your level of activit y and dress. This is more important for women than men because of the options of clothing. You don’t want to carry one place when you are at work and another when you are at home. It is important to practice and have deep in muscle memory your draw. The last thing you want is to go for your gun under your bra and remember that you wore the ankle holster or vice versa. Take a look at what is your most common dress and build a carry system around this. I say carry system because it involves a holster, a weapon, and the draw techniques you should develop to support it. Talk to other women who carry, go to your local ranges and ask around. Try out a couple different carry options for a couple weeks to work out the issues before you settle on one. Two piece clothing lends itself to either a under the waistband carry if you have clothing that hangs over or a bra holster. This tends to be easier to access and keeps the pistol secure. Most like to draw from the strong hand side. Look out for chafing from the holster and the tendency to jab you when you sit down. Remember if it is uncomfortable, you will most likely start to “f orget” to carry your gun. Don’t make the mistake of leaving it behind when you might need it. Ankle holsters are good with pants and if you spend a lot of time sitting down as in a car or bus. They are also a good option for a second gun. Dresses and skirts lend themselves to thigh bands. Thigh bands are usually worn on the leg opposite the strong hand for access. Look for breathable material that will stay “stuck” to your skin – the last thing you want is your weapon to drop at your feet at the Starbucks counter. With a thigh band you will probably have to limit your self to a small semi automatic to keep it from causing a bulge. Once you have decided on a carry system, take a couple weeks to put it through its paces. This is a good time to use a blue plastic mock up of your pistol. If you don’t have one, you have to make doubly and even triply sure your pistol is unloaded. See if it chafes, if the pistol drops out if you jump up and down. Try drawing if from standing, sitting on a chair and in the car, lying on your back. If you can’t reasonably get to it, look to a different system. Make sure you put on jackets you might have on in the winter. If you carry a purse, decide what you are going to do with your purse if you have to draw. Practice, practice practice. Once you have decided on a system – holster, gun, and draw method, it’s time to start dry firing until you feel ready to go to the range and put some rounds down range. Don’t neglect the dry fire. First it will save you time and money on range time and ammunition. Secondly you will get proficient faster through dry fire and finally you have to have a safe draw rehearsed before you go out to the range. If you start waving your gun around at the range, there is a good chance the range master will kick you off the firing line. Concealed carry doesn’t mean you have to have a Desert Eagle strapped to your hip. Take a look around, try out your options and see what works for you. Let us know in the comments what how you conceal carry.